In the span of one week, RENEW presented “Solar Champion” awards to three companies—JONCO Industries, Central Storage & Warehouse and O&H Danish Bakery--that now host some of the largest rooftop solar electric systems in the state of Wisconsin. The award presentations took place during individual ribbon-cutting ceremonies at each company, two of which were organized and emceed by RENEW’s incoming president Amy Heart. The three PV systems honored by RENEW have a combined rated capacity of about 1.26 MW(DC) . Mayor Tom Barrett, and John Daugherty of SunVest. Located in Milwaukee’s North Side, JONCO Industries hosts a new 370-kilowatt array on a 200,000-square-foot building it acquired in 2014 to expand its contract manufacturing capabilities. 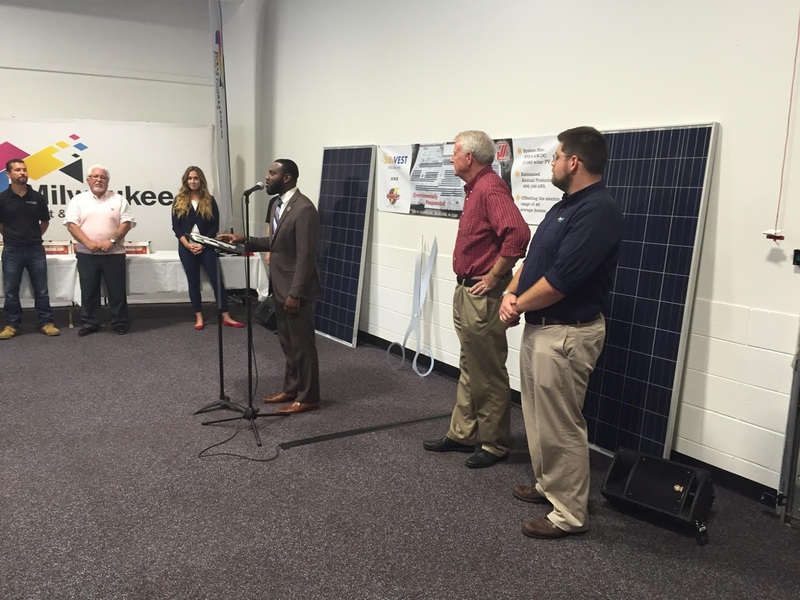 A number of local dignitaries, including Milwaukee Mayor Tom Barrett, gathered on July 13 to praise JONCO’s achievement in integrating clean energy into his company’s operations. Said JONCO president Tom Ryan: "If we want to invest the money and time to build the rooftop solar. I'm not looking for today, but I've calculated it out — it's going to take me four years to pay for that roof." On behalf of RENEW and Pewaukee-based SunVest, which designed and installed the array, RENEW Executive Director Tyler Huebner presented a certificate recognizing JONCO Industries as “the largest solar electricity producer among Wisconsin manufacturing companies." Jack & Ken Williams (extreme right). Read more on JONCO’s solar installation in a Milwaukee Journal Sentinel article. Later that day, Central Storage & Warehouse (CS&W), a Madison-based, family-owned company that owns several refrigerated warehouses in Wisconsin, hosted an event celebrating its 2,904-panel solar system. The 741-kilowatt system designed and installed by Madison-based SunPeak is sized to produce 20% of the electricity consumed at the adjoining warehouse, which was rebuilt after a devastating fire in 1991 that melted food in storage worth millions of dollars. At the celebration Madison Mayor Paul Soglin and RENEW Program and Policy Director Michael Vickerman congratulated CS&W for embracing environmental performance and clean energy as it rebuilt its physical plant in the ensuing 25 years. This rebuilding culminated with the installation of the largest rooftop solar electric system in the state. SunPeak and RENEW presented a certificate to CS&W Vice President Jack Williams honoring the company’s leadership in advancing solar energy for Wisconsin businesses. Both Williams and Vickerman also praised the Focus on Energy program for providing critical funding support for this precedent-setting installation. For more information about CS&W’s solar installation, visit SunPeak's website. O&H co-owner Eric Olesen cutting the ribbon while Rep.
Cory Mason, Michael Vickerman, and Amy Heart look on. 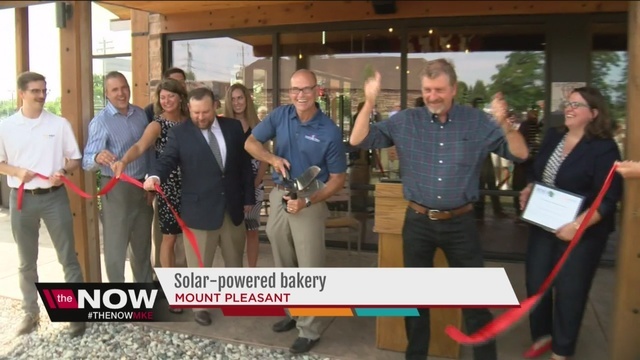 RENEW and SunVest teamed up again the following week to organize a ribbon-cutting ceremony for a 152-kilowatt solar system atop O&H Danish Bakery’s new headquarters building in Mount Pleasant, near Racine. O&H built the 44,000-square-foot facility in 2015 to house all of its baking operations under one roof. The solar panels atop O&H’s roof should produce 180,000 kilowatt-hours a year, supplying about 25% of the electricity used in that building. O&H’s Mount Pleasant facility will enable the renowned Kringle maker to add about 25 new positions over the next three years. RENEW’s new president, Amy Heart, presided over the ceremony, which attracted such local dignitaries as Rep. Cory Mason and M.T. Boyle, who represented Racine County Executive Jonathan Delagrave. Several years ago, Rep. Mason authored legislation designating the Kringle as Wisconsin’s official pastry. Wrapping up, RENEW’s Michael Vickerman presented a Solar Champion certificate to O&H co-owner Eric Olesen, recognizing the company’s status as the largest solar electricity producer in Racine County and the largest solar electricity producer among Wisconsin bakeries. Read more about O&H’s solar installation in a piece from TMJ4. All three solar electric systems will enable these signature Wisconsin businesses to manage their energy costs more effectively and strengthen their economic position in the highly competitive business environments they operate in. Focus on Energy funding support was instrumental in persuading these economic mainstays to plow their own savings into solar. The Public Service Commission will soon decide whether to continue rebates for renewable energy in 2017 and 2018. We hope to enlist these and other renewable energy hosts to educate the PSC on the positive connection between their renewable energy investments and the health of their businesses.